Represented in my haul by LBBs like Supplement 1: 1001 Characters or Supplement 2: Animal Encounters, these were supplements which these days could largely be replaced by a simple computer program; providing a spate of pre-rolled materials – the former a bunch of NPCs, the latter a bunch of animals – saving the referee of rolling up such material during actual game sessions (or between game sessions, if you don’t have an enormous amount of time for prep). For modern-day gamers with accessible to reasonable technology, some of these supplements are entirely redundant unless you’re, say, getting them free with the purchase of a second-hand copy of Deluxe Traveller. A somewhat more high-value version of this type of supplement would be those which detailed specific sectors of space – The Spinward Marches being the first one. These not only do all the dicerolling to populate a sector with worlds for you, but also do all the work of drawing out the maps, undertaking more complex tasks like plotting out trade routes, and giving little descriptions discussing each of the major subsectors and highlighting some areas of interest. The labour saved is appreciable, and also of a complex enough nature that you’d need a slightly more advanced program to automate it; such automated programs still exist, of course, but then again for the purposes of adventuring in the official Traveller universe the original sector descriptions are still useful – and are thin enough on the details to be preferable if you want the freedom to fill out the gaps yourself (as opposed to later supplements like the GURPS Traveller Spinward Marches supplement which tried to give a rundown on every planet detailed). This was only really represented by one full-fledged book in the range – though the magazine Journal of the Traveller’s Aid Society offered adventure seeds too. 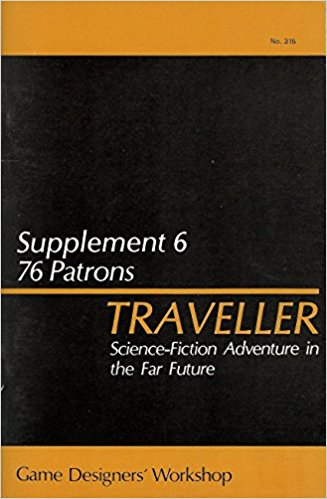 This is the magnificent Supplement 6: 76 Patrons, which provides 76 adventure seeds divided up by group size, with each of the titular patrons being written up in a few paragraphs detailing who they are, how they contact the characters, and what they ask for, and then each of the seeds being provided with a random selection of different outcomes for the referee to either randomise or select as they see fit in order to establish what’s really going on and what major complications may be involved. It’s a simple format for adventure seeds that a few others have used over the years – Pagan Publishing’s Tales of Terror format was lifted from it, for instance – and it’s a highly useful supplement which gives a massive amount of potential gameplay per page count, even if you only use a fraction of the patrons in here. These are represented in my haul by Adventure 2: Research Station Gamma. This has the player characters approached by a cute alien who appeals to them to help it rescue its little buddies from the titular research station. The adventure outlines the planet it takes place on, provides details of rumours that the player characters may pick up not just about the research station but the world in general, as well as some neighbouring world, and provides a detailed rundown of the research station, the robots that manage it, and the various specimens imprisoned there. In short, it provides you with most of the tools you need to throw this little critter’s problem out there for the player characters to poke at and then sit back and see what the players do with it. That said, it’s interesting to see what blind spots scenario designers of this era had. The head of the research station is detailed in the booklet and some brief notes on his background and motivations are given – but little more than that. We are not told what his daily routine is (which would allow us to work out where he’s likely to be and what he’s likely to be up to when the PCs come calling), nor are we given any real guidance on his reaction to the PCs’ activities; this means that anyone running the adventure needs to do some further development work themselves to decide how they’re going to roleplay him. Spacing on the whole “personality and reactions to others” angle is, I guess, entirely in keeping with the rather STEMlordy tendencies that Traveller has exhibited over the years, but it’s still disappointing when it happens. 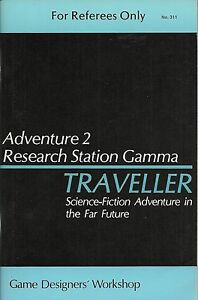 The adventure is also significant for being the first of a series; in its sequel, Twilight’s Peak, clues established in Research Station Gamma can lead PCs onto the trail of the Secret of the Ancients – which was later greatly expounded upon in the adventure Secret of the Ancients. 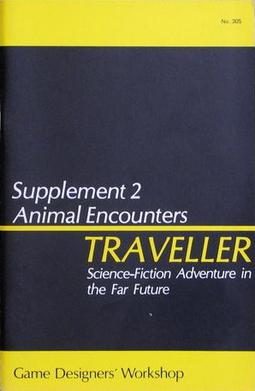 This may well qualify as the very first metaplot in an RPG – followed up later in Traveller‘s publishing history by the Fifth Frontier War, the Rebellion, and the Virus which heralded the controversial Traveller: the New Era. 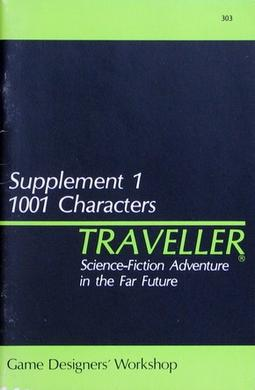 Whilst I can’t say I have much affection for Traveller metaplot – or for RPG metaplots in general – at the same time, I guess I can see why GDW kept going to the metaplot well, since earlier ones like the Secret of the Ancients or the Fifth Frontier War seemed effective at adding spice to the Traveller setting without upstaging people’s home campaigns. The discontent of some with the Rebellion – and the howls of protest over the Virus – may hail from the fact that those metaplots had such vast and wide-ranging consequences that if you didn’t want to implement them, much subsequent material would end up useless for your home campaign.